The Southern Arizona Travel Guide is a resource for those planning a road trip or vacation to the region. The southern half of Arizona, including the metropolitan Phoenix and Tucson areas, is within the Sonoran Desert. While the region is extremely warm during the summer, mild, dry, and sunny weather is the rule from mid-autumn through mid-spring. This section covers the Central and Western Desert areas, including the Apache Trail, Tonto National Monument, Superstition Mountains, Boyce Thompson Arboretum, Casa Grande Ruins National Monument, Organ Pipe Cactus National Monument, the City of Yuma, and the Town of Quartzsite. This guide offers descriptions of many points of interest, links to many references, travel itineraries, and suggested visit times. See below for Central and Western Arizona Desert Points of Interest and the complete Index for this guide. President Theodore Roosevelt called the Apache Trail "one of the most spectacular best-worth-seeing sights of the world". Roosevelt drove the road by car in 1911 on the way to the dedication of the lake and dam named in his honor. The Apache Trail continues to be a gateway to spectacular, unspoiled scenery as well as outstanding water recreation on Canyon, Apache, and Roosevelt Lakes. The trail twists and turns through contorted canyons and desert saguaro forests. It features twenty unpaved miles, including the tortuous and thrilling drop down Fish Creek Hill. The route drops about 900 feet in a mile into Fish Creek Canyon. Take Arizona-88 from the town of Apache Junction, then AZ-98, ending up in Globe for the return on US-60 west. Scenic loop trip can include Tonto National Monument and Boyce Thompson Arboretum (see below). Time: minimum of one very long day. Tonto National Monument features two fascinating cliff dwellings built and occupied by the prehistoric Salado people in the first half of the 14th century. It lies at the head of a lush side canyon with fine views of Roosevelt Lake in the distance (ruins photo, courtesy National Park Service). The Upper Ruins are accessible only by a popular ranger-guided hike requiring advance reservations (for info, call 928-467-2241). The Lower Ruins are self-guided. Located off of AZ-98 near Roosevelt Lake. Time: Lower Ruins, an hour or more; guided tour of Upper Ruins, allow half a day. Good stop to combine with the Apache Trail loop trip (see above). The rugged Superstition Mountains feature the Superstition Wilderness, one of the premiere hiking areas convenient to the Phoenix metropolitan area. The well-developed trail system offers a range of opportunities ranging from easy hikes to challenging backpacks. Due to the relatively low elevation, the best seasons are fall through spring. A nearby option is the Lost Dutchman State Park. The park offers camping, picnicking, guided activities in season, and hiking trails with access to the adjacent Wilderness area. Its name, Lost Dutchman, refers to the old prospector, Jacob Waltz, who died without revealing the location of his fabled gold mine, deep in the Superstitions. Adventurers have been searching in vain for the mine ever since. Access is off of US-60 and the Apache Trail (AZ-88). Time: one long day or more. 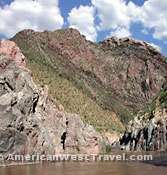 The Salt River, the primary source of water for Phoenix and the Valley of the Sun, runs through a steep and spectacular canyon about 100 miles east of Phoenix. In most years during spring runoff, the river offers a very exciting and scenic venue for white water rafting. Highway US-60 crosses the river between the towns of Globe and Show Low. The highway descends 2,000 feet of steep switchbacks, crosses a bridge, and ascends the opposite side of the canyon. The route is considered one of the most scenic in Arizona and also offers access from the desert area to the White Mountains. The canyon is part of the Salt River Canyon Wilderness. This very remote area has no maintained trails and is mainly visited by skilled white-water rafters, who venture down the Salt River during the short and dangerous river-running season from March 1 to May 15. One of the oldest and largest botanical gardens in the American Southwest, Boyce Thompson Arboretum offers simultaneously spectacular and diverse scenic beauty along with an educational experience. Thousands of plants from the world's arid regions are integrated with a beautiful slice of the Sonoran Desert. With its 350 acres and miles of trails, the arboretum has much more the feel of a park than a garden. In fact, Boyce Thompson is officially an Arizona state park. The beautiful trail through lush Queen Creek Canyon is pleasant even in the summer. The visitor center offers a variety of exhibits and programs. Located near Superior on US-60. Time: allow 2-3 hours. The Casa Grande Ruins is part of a village of the ancient Hohokam people. The Casa Grande, or Big House, dates to about 1350 A.D. and represents the height of Hohokam architecture. The structure, originally four stories high, was constructed of caliche mud. The site also includes remnants of the ancient walled village and a prehistoric ball court. Casa Grande was abandoned for unknown reasons about a hundred years after it was built. There are self-guided tours of the site. The visitor center offers a museum. Located near Coolidge off of AZ-87/287. Time: allow 1-2 hours. Organ Pipe Cactus National Monument preserves a diverse landscape of the Sonoran Desert, especially rich in cacti and other desert vegetation. 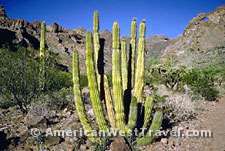 The area around the monument is the only place in the U.S. where the exotic organ pipe cactus (photo, right) grows. Huge saguaro forests can also be found. Desert trees such as paloverde, mesquite, and ironwood are also common. The environment of desert mountains, bajadas, and riparian wash is especially lush. Due to the proximity to the Mexican border, access to back roads and other backcountry areas is restricted. The large and popular campground is open and safe, according to the National Park Service. Located south of Ajo on AZ-85. Time: the remoteness probably requires an overnight stay. The small, dusty town of Quartzsite in western Arizona, with a year-round population of 3,000, swells to a population of nearly one million every January and February. The town is a favorite destination of "snowbirds", RV enthusiasts seeking a warm winter climate. The at-large camping in the desert is a far cheaper alternative to expensive RV parks. The town's real winter attraction is a series of eight huge gem and mineral shows which have become an international event with hundreds of dealers offering gems, minerals, jewelry, and other handcrafted items and collectibles to hordes of enthusiasts. The city of Yuma in far southwest Arizona is another popular winter destination noted for its outdoor recreation which range from golf to hiking to hunting in the fall. It is a jumping off point for the Imperial National Wildlife Refuge which offers opportunities for hiking, hunting, fishing, and boating. The Kofa National Wildlife Refuge, north on US-95, offers an interesting hike to Palm Canyon, one of the few native palm groves that exist. Historical sites include Yuma Quartermaster Depot, Yuma Crossing, and the infamous Yuma Territorial Prison.